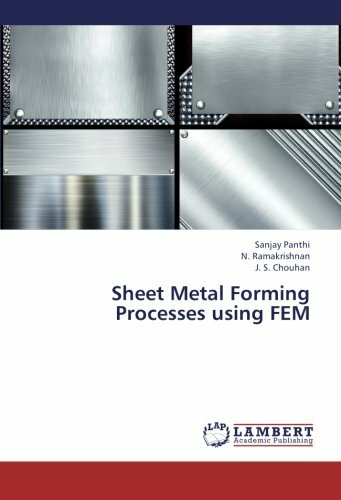 Panthi Sanjay; Ramakrishnan N.; Chouhan J. S.
This book particularly addresses the prediction of springback in sheet metal forming process. Sheet metal forming is a process in which a straight length of sheet is transformed into a curved length. It is generally employed in the automobile \& aerospace industry to manufacture the curved parts, in the construction of channels, drums, large spherical \& cylindrical tanks etc. The major concern in any sheet metal forming process is usually to obtain an accurate and repeatable bend angle due to elastic recovery of the material. Shape discrepancy between the fully loaded and unloaded configurations due to elastic recovery of the material is known as springback. Springback causes the deviation of the final product from the targeted dimensions. Hence the tool design, for a given sheet material and the final product dimension, should be capable of accurately incorporating the elastic recovery. In this book, the prediction of springback and parametric study is carried out for the arc bending and Straight flanging process. I did B.E. in civil Engineering, M.E. Environment Engineering and Ph.D. in civil Engineering. Presently working as a scientist at AMPRI-CSIR, Bhopal, India-26. My working area is in metal forming processes by experimentally as well as by Finite Element Simulation. My expertise is in the springback analysis in sheet metal forming processes.